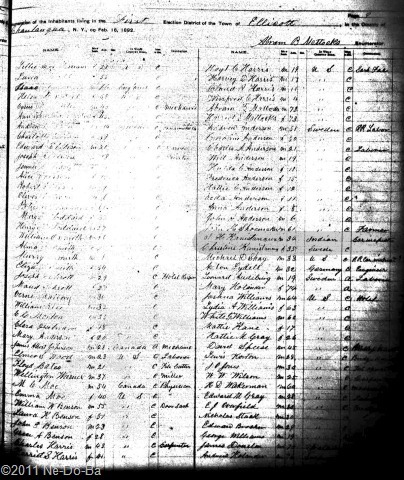 Today I am posting another page from the 1892 New York State Census. I think I found Henry Kanistanaux in Ellicott, Chautauqua Co., NY. Page 9, Ellicott, Chautauqua Co., NY, dated 16th of February 1892. This person is much too young to be Isaac Kanistanaux, but of proper age to be Henry. I would certainly like to find a bit more proof before I completely commit to this identity, but for now I will list this as Henry Kanistanaux. He is married to a Swedish woman about his own age. I will need to search for a marriage record to see if it will give me more information and confirm his identity.